You are here: Home / Types of Tea / Chai Tea / Jaipur Avenue Cardamom Chai Tea Mix: Excellent! Jaipur Avenue Cardamom Chai Tea Mix: Excellent! I had a delicious, aromatic mug of Jaipur Avenue’s Cardamom Chai Tea last night and loved every drop. It’s right up there with the Original Masala for me (read my review of Jaipur Avenue’s Original Masala Chai Tea Mix). Like the Masala, the Cardamom has the exotic, deliciousness you expect from chai tea. It may have been a hint sweeter, but if I weren’t looking for a difference, I doubt I would have noticed much of one. For someone as obsessed with Chai Tea Lattes as I am, this is a GREAT thing! Authentic Indian chai tea spiced with cardamom. All-natural ingredients. No preservatives and food additives. Mix contains premium black tea, dry milk powder, a delicate blend of exotic spices, and minimal amount of sugar. Easy to prepare – add hot water for a cup of heartwarming chai, or chilled milk and ice for a cool, refreshing summer drink. A box contains 15 individually packed servings. Each packet makes an 8-ounce cup. To learn more about Jaipur Avenue, visit their website. 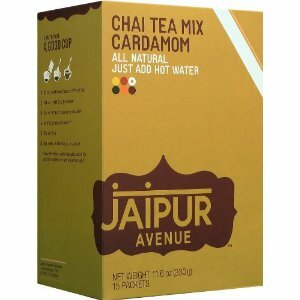 Order Jaipur Avenue Chai Tea Mix Cardamom on Amazon. I’ll have the review of the Vanilla Chai Tea Mix up tomorrow. I really look forward to this tea, in fact I’m just seconds away from my first taste. Previous Post: « Jaipur Avenue Chai Tea Mix, Make Chai Tea Lattes at Home!